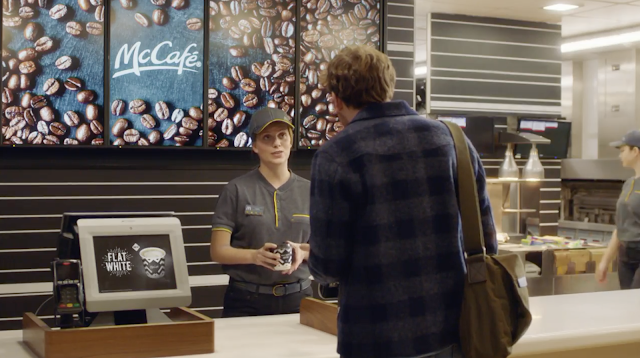 Would-be coffee drinkers come up against the pretentious coffee market in Leo Burnett London’s new campaign for McDonald’s McCafé, introducing the latest addition to the menu – the Flat White. Following on from McCafé’s successful brand relaunch last year, this new Flat White campaign is a continuation of the strategy of poking fun at the category. With a mission to demystify and democratise coffee for the masses, it highlights McDonald’s role in the market with its offer of ‘Great tasting coffee, simple’. In the film, customers are seen in numerous coffee shops trying to get a sensible explanation as to what exactly a Flat White is – only to be met with condescending faces, impenetrable descriptions and nonsense explanations. We start to realise that, in reality, no one knows precisely what a Flat White is. Finally a sensible definition comes – from a woman working behind the counter at a McDonald’s. ‘It’s like a stronger latte just with less milk,’ she cheerfully tells a customer, who is happy to get to the bottom of the mystery. The ad finishes with the voiceover saying ‘Now at McDonald’s’. The campaign breaks on 12 February on television, backed by Facebook activity, out-of-home, radio, press, geo-texting and sales promotion vouchers.